I meant to post this way sooner, but I had the sale, and then I went out of town. So now that I'm home, here it is! This was a reconstruction from a Threadless "Poetic Irony" tee. I'm obsessed with one-shoulder tops right now! I was super inspired by a top Taylor Swift wore in her Stripped version of "Untouchable". Basically, a super puffy-sleeve, and a slick fitted style. I loooove the print--it's morbid and beautiful and you can see a better photo here. This shirt sold at the sale, but the other new items need to be re-photographed (when it's not 2AM, which was when I took them before) before I can post them. I promise to do it in the next few days! 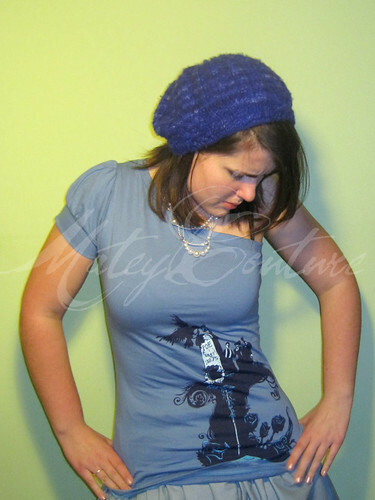 Expect some shirts of this style to be listed in the shop... some from threadless shirts, some from just pretty fabric. Also, I just got accepted to college for spring semester (! ), and this probably means I'll be closing the shop during this time. I'll keep you updated on everything, though! Ooo, I love this one! And YAY again for college acceptance! WOOT! You rock, Addy! Way to go with college! Love the color of the shirt and the cute style. AAAAAHHH! 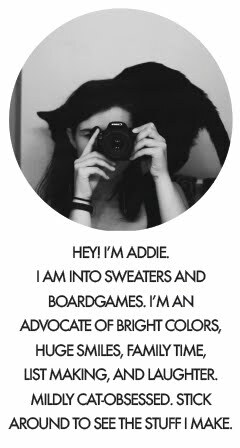 Addie! Yay! I knew you would get it! I'm so proud of you, girl! You have your own shop, now college, and talent dripping from your fingers! :) I had to add that last part, in honor of your 'Poe' post. Dana - Aw, shucks, thank you! We need to talk soon! &, love you too!